Some of you probably read the blogs of my dear friends Nicole and Marie. They are amazing. They knit socks. They call their socks "Sock." And they take Sock wherever they go. Sock is a very privileged sock. Then my mother started knitting a sock. Her sock goes wherever she goes. Sock goes to bed, book study, piano lessons, doctor's office, dentist. Her sock is also very privileged. I became sad. I saw Marie with her friend Sock, Nicole with her friend Sock, and Mommy with her friend sock. I did not have a sock. I was lonely. So, I went to the yarn store and bought Yarn. Yarn is what sock is called before he becomes Sock. And my mother ordered me Sock Needles. Sock Needles are Sock's best friend. Now I have the makings of Sock! But my sock is going to be special. He is not going to be like the other home knitted socks of this world. He is going to achieve grand and glorious things in his lifetime like keeping my often freezing tootsies warm. "Sock" is too boring of a name for such a unique individual. Therefore, rather than meeting my friend "Sock," I am now introducing you to Wilfred. "Why do you call me good?" Jesus answered. "No one is good except God alone. You know the commandments: 'Do not murder, do not commit adultery, do not steal, do not give false testimony, do not defraud, honor your father and mother.'" "To make us realize how great is our need of repentance, Jesus gives us a special perspective in this passage. To expose this young ruler to the depth of his sin Jesus, who knows that the young man will not face his sin, confronts him with 'the evil of our righteousness.' The early American evangelist George Whitefield first used this phrase, to confront the self-righteous with the inadequacy of our own goodness to qualify them for heaven. "I rediscovered the arresting power of Whitefield's phrase when recently talking with another pastor in an airport restaurant about the nature of true repentance. When I said, "George Whitefield taught that we need to sense not only the evil of our sin but the evil or our righteousness,' a woman listening nearby turned to us. 'Oh no!' she said. 'Do you mean that I have to feel guilty for good, too?' I smiled and said, 'No, that is not really the point, but God wants us to know that our good works are not good enough to make him love us. That is why we need Jesus no matter how good we think we are.' The goodness of our good works can be truly good and a blessing to others. There is a danger in making people think that there is nothing they can do that will please God or help others. Still, there is never sufficient goodness in our best works to make them truly holy by God's ultimate standard. That is why our best works still fall short of qualifying us for heaven." I'd love to have your thoughts on this quote. What do you think? Agree? Disagree? Leave a comment! Adam is very old. And I named him because he, cuz I learned Adam from Seven Brides for Seven Brothers. And it's a really good movie. Adam's favorite food is meat, and Adam's favorite candy is gum. He's really, really, really my favorite stuffy. Really, really, really, really. Adam one time was mean. He bit Pinky, my WebKinz stuffie. And one time he was nice. And you know what? He gave Pinky a crown. Isn't that cool or what? Now Adam's really really nice, and he's my friend. And now he has holes, but Grandma and I are going to fix him really really good. He's my best friend. That's what we call him...Bobby. There's always someone who then questions us with a confused look when we use that name for him. "Bobby? Did you just call him Bobby?" His real name is Collin Brett, so no one can figure out how we came to call him Bobby! It's a random story: When Mia was little she called Alissa and I "Sissy," so we tried to get her to call Collin "Brother." She tried and the result was "Bobby." And it stuck. I'm not sure how it did, but Collin's definitely doomed to be "Bobby" for the rest of his life because everyone calls him by that name now. Not just our family, but also his friends, my friends, our friend's parents, cousins, etc. I couldn't find a really good picture of Bobby so I thought this one would work. The master is here executing his wicked overhand volleyball serve. Collin is also sic mountain biker. He loves mountain biking on...mountain biking trails I guess. We have some trails around our woods that he bikes on occasionally, and he just finished a crazy, rad jump that he made out of two by fours. I plan to have 911 already dialed when he goes off it the first time. I'm sure you're wondering how Collin gets along with a house full of girls; or as he would put it, "this hothouse of female emotions." He actually does pretty decently. He's used to us all crying all the time, and although he does occasionally overdo the girly emotions jokes, he knows when enough is enough. To tell the truth, I think the only thing that keeps us from completely falling apart sometimes is his sensible approaches at fixing the gigantic, huge, overwhelming small daily problems that can sometimes tip our emotions scales a little too far one way. I love this quote. As a book nut, the picture of books...all kinds of them piled everywhere, providing unlimited entertainment and information is so compelling. One of my many small dreams is to have a library in my house someday. With big cozy chairs and some fuzzy blankets and quilts, and tall bookshelves with the books two deep on them. Twelve years old and full of life...twelve year old life. Growing up can be awkward when you're still only a kid. Her days are full of silly faces and voices with equally silly friends, playing in the dirt outside, and trying to make others laugh, combined with church choir, algebra 1/2, shopping, coffee dates, and volleyball with the older kids! Lissy makes friends easily, and as long as goofiness is allowed, is fun to have around. She purposely annoys me and thinks it's funny as any good little sister would, but is also one of the most forgiving people I know. She hopes to begin volunteering at the library soon, enjoys book club, adores her Webkinz stuffed animals, loves IMing with her friend in Montana, and playing in the woods with her friend over here. I'm in the process of applying for a second job right now. Alissa was looking over my resume one day and noticed my funny, very unprofessional e-mail address on the top. She said something along the lines of, "That looks pretty funny on here!" "Yeah, I know. I should have made a separate boring one like kaishathomas@somewhere.com or something like that." "Yeah. You should have made one called all.work.no.play@somewhere.com!" Miniature donkeys and ponies, a foal, apple cider donuts, a hay wagon pulled by a tractor, pumpkin fields, goats, hot apple cider in a funny little cafe, chilly wind, a camel (? don't ask me, I'm still confused), baby pumpkins, a corn maze. All that for two dollars! It was freezing cold, but Mia, Ania and I had a great afternoon with some friends out at Stoney Ridge the other day. We petted the foal, and fed the little pony grain, chose mini pumpkins, and then went inside a cute, funny little cafe and ordered a dozen little apple cider donuts, and hot apple cider. This is her royal majesty, Princess Miana Grace (age 6). And that about explains it all. Princess, scary reader, beauty queen, fish, book worm, national champion speller (someday), hopeless romantic. Like every little girl, she has a passion for princesses. Her favorite movie is Princess Diaries because the main character is a princess...and her name's Mia. Princess Mia. She loves to walk around the house with plastic princess heels, skirts, and t-shirts on. Her outfits are a definite source of daily entertainment. This is Mia reading to some ladies on vacation this summer. When she gets into the book she starts reading rapid fire and speaking in an English accent! She can also spell better than most of the people in our household. She corrects our spelling, and we're even getting into the habit of asking her spelling questions! She's almost guaranteed to be cheerful, and is almost always happy to have quality time with us. She loves watching movies with Daddy, playing Webkinz with Alissa, and playing with Collin in the garage. Over the next few posts I plan to introduce my family. I know most of you reading this know everything there is to know about my family, but because they're so important to me you get to meet them anyways! This is my Ani-Girl. (Ania Marie) She's 3. And smart. Definitely a computer geek in the making. She can click on the iTunes icon down by the start button, get the music playing and click on the button that makes the album covers full screen. That's her favorite view. She has an ancient laptop, and will sit and type on it for long periods of time, during which we can find some precious moments to clean up the messes she's made. She also loves music. She asks for it all the time, and will get mad if you change songs when she was enjoying the one that was just playing. She can carry a tune and sing most of the words to songs by one of Collin's new favorite artists: Stellar Kart. She also sits at the piano and plunks out prettier tunes than I could without black notes in front of me! She loves being chased around the living room by roaring siblings, sitting on laps with blankies during a movie, and begging food off anyone who happens to be chefing it up in the kitchen. October 14th will be her three year "gotcha day" anniversary! Her newest thing to say (she has a small vocabulary) is "Yur FAT!" 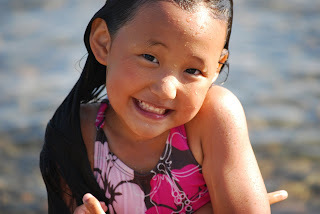 A mischievous grin comes over her face before she announces it, then giggles erupt when you say back, "No you're fat!" The answer is then of course, "No, yur fat!" 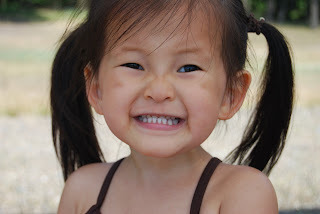 Her adorable grins and silly faces easily make up for her passionate temper. We love our Ania! One of her good friends, "Pink Puppy" poses in pictures with Ania on vacation in Idaho this summer. The neighbor's yard was irresistible. Not only was the house empty, but the unmowed lawn was covered with a bed of dandelions. What is more tempting to a little girl than to sit in one spot amongst the beautiful sunny flowers and pick everyone within her reach? And what does one do with beautiful flowers freshly picked? Every girl knows her mommy's love for a bouquet! Tripping into the house, our girl proudly presents the gift to her mother. The wilted dandelions droop sadly from the edge of a small crystal vase as Mommy wipes sticky dandelion juice off the counter. What does the mother think of such a lowly gift? She loves it. 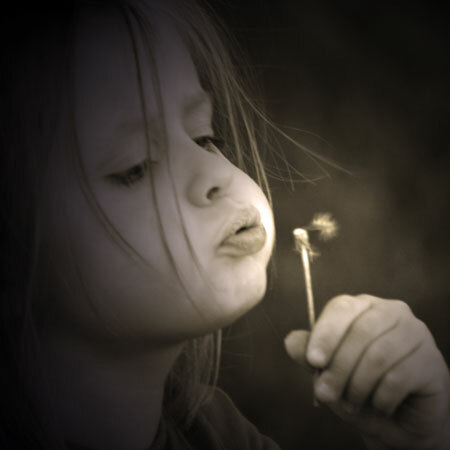 Though she would prefer roses to wilted dandelions, the gift was from her precious child. Her baby had handed her the flowers with a smile on her face, trusting that her mother would be happy with them though they were a poor present compared to what her mother had sacrificed for her. "We cannot, by our best works, merit pardon for sin...by reason of the great disproportion that is between them and the glory to come; and the infinite distance that is between us and God. ...by them [i.e., our best works], we can neither profit, nor satisfy for the debt of our former sins; but when we have done all we can, we have done but our duty, and are unprofitable servants; and because, as they are good, they proceed from His Spirit; and as they are wrought by us, they are defiled, and mixed with so much weakness and imperfection, that they cannot endure the severity of God's judgement. "...believers being accepted through Christ, their good works also are accepted in Him; not as though they were in this life wholly unblameable and unreprovable in God's sight; but that He, looking upon them in His Son, is pleased to accept and reward that which is sincere, although accompanied with many weaknesses and imperfections." What I do in this life merits me nothing before God. Because I am His child through Christ, His love for me will always be the same; just as the mother's love for her little girl is untainted by the poorness of the gift. Yet simply knowing that Christ loves me no matter what, gives me a desire to do what He asks of me. As I work by His grace alone to do the right thing, imperfect though it will be through my humanness, I can present it to Him in faith, knowing that He will accept it out of love for me: His own little girl.